The purpose of the suit is to harass and discourage rather than win. The law can be used very easily to harass, and enough harassment on somebody who is simply on the thin edge anyway, well knowing that he is not authorized, will generally be sufficient to cause professional decease. If possible, of course, ruin him utterly. 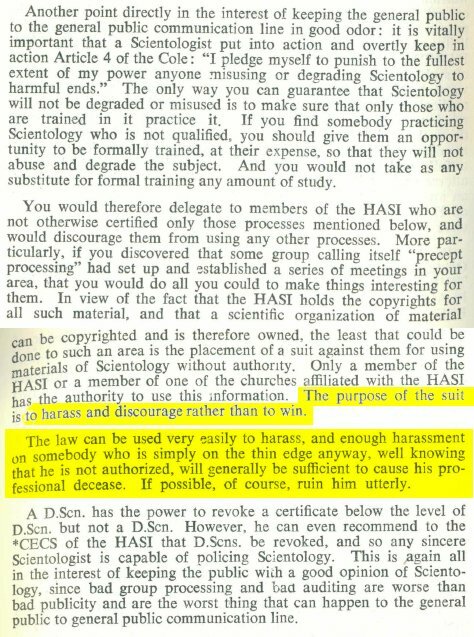 What Hubbard was discussing in this passage was the measures that can be taken to prevent people from using Scientology materials outside the church, e.g., to deliver unapproved auditing services. Hubbard claims the public needs to be protected from incompetent practitioners, but his real concern was loss of income, and loss of control over the Dianetics and Scientology movement, as had previously occurred in New Jersey. Why was the ``purpose of the suit'' quote deleted? The passage has caused much bad publicity for Scientology in the past. The unexpurgated version of that section of the article was filed as Exhibit G in the Fishman Declaration (reproduced below). The nastiest bits were bracketed in the filed version, so the court could see the evidence that Scientology's aggressively litigious nature was part of its official doctrine. Altering Hubbard's writing is one of the highest crimes in Scientology. But the cult routinely edits his work by discovering that an offending passage was actually written by some nameless "suppressive person" and inserted somehow into Hubbard's text prior to publication, usually as part of a "plot to destroy Scientology." There must have been an awful of lot of these suppressive persons working in the Hubbard Communications Office, because there have been a lot of changes over the years, but it seems these persons only get discovered when there is inconvenient text that needs to be disposed of. This article, still odious despite the minor deletion, has been cited in various legal filings over the years, including the Fishman Declaration, as "Magazine articles on level 0 checksheet." Here's an explanation of where this mis-identification comes from. Each Scientology course begins with a checksheet that lists the materials to be read and the exercises to be done on that course, in the order in which they are to be undertaken. "Level 0" is the first level of the academy course, i.e., the first level of auditor training. In 1968, the Hubbard College of Scientology, a branch of the Church of Scientology of California, published a 100 page booklet called "Magazine Articles on Level 0 Checksheet" that contained eight articles from Ability magazine and the Journal of Scientology. This booklet was apparently part of the auditor curriculum at one time, but it does not appear at all in more recent (circa 1990) versions of the academy levels, at least in the checksheets I've examined. According to Professor Steven Kent of the University of Alberta, who has studied the Scientology cult since 1986, "This item is required reading in the 1991 'Department of Special Affairs, Investigations Officer, Full Hat' course. Elsewhere in this same magazine article, Hubbard discusses what to do if a Scientologist encounters legal troubles. Again, an aggressive, even vicious response is urged. Is he crazy to be concerned about ``arrest for the practice of Scientology''? I think his concerns about legal trouble were well-founded, but he's distorting the situation in which an arrest would be likely. The practice of the Scientology religion is not illegal. But practicing medicine without a license is. And so is making unjustifiable medical claims in advertising material -- which is precisely what Scientology got into trouble for a decade later, when the FDA seized hundreds of E-meters. Even in this article, despite his worries about legal trouble, Hubbard boldly states that physicians and psychologists cannot cure mental or psychosomatic ills; only Scientologists can do that. He wants to practice medicine and psychotherapy, but he knows it's dangerous to do so openly. Hubbard's prohibition here against prescribing vitamins is curious, because one of the fundamentals of his Purification Rundown is dangerously high doses of Niacin. Obviously he did not take his own advice. Yet he's so concerned about being charged with illegally practicing medicine that he warns against even recommending diets. Inconsistency is one of his hallmarks, and the alternation within this one document between sweeping claims and paranoid defensiveness is definitely in character. The SCIENTOLOGY organization exploits every opportunity to hide behind their so called religious status. This posture is epitomized by a SCIENTOLOGY document entitled, Level O Checklist. In the Level O Checklist, instructions are given to SCIENTOLOGY members who are approached by medical doctors while these members are attempting to employ SCIENTOLOGY methods and practices to patients in hospitals and nursing homes. The Instructional Guide states the SCIENTOLOGY member is to claim religious status when approached by a medical doctor if the doctor is disturbed or displeased with the SCIENTOLOGISTS administering medical treatment to the patient. If the SCIENTOLOGY Member is arrested, a lawyer will be provided immediately and a suit is to be instituted in excess of $100,000 against the doctor and anyone else that it might be advantageous to sue for violating the SCIENTOLOGIST'S first amendment rights in practicing religion on the patient. Below is a reproduction of parts of Exhibit G of the Fishman declaration. Court-stamped page numbers appear in parentheses at the bottom. The full exhibit occupies pages 56-58 of the declaration (with 55 being a cover page) and reproduces approximately 4 pages of an article that occupies 27 pages in the red volumes. The version of Exhibit G given here is further abbreviated somewhat, in order to avoid quoting more extensively than necessary from a copyrighted work. Numbers appearing in dashes are the page numbers from the original magazine article. clerk in the court of the area in which your case has come up. BEEN FILED WHEN THE HASI ATTORNEY ARRIVES. for, if you do you are harming all other Scientologists in the area. further attack not only yourself but all those who work with you. ous occupation, that fortress may, and most often does, fall. >> Scientology takes all its objectives. substutute for formal training any amount of study. >> is to harass and discourage rather than win. >> fessional decease. If posible, of course, ruin him utterly.